Feeling Pac inspired this evening, so going to try to work out my top ten tunes from Tupac Amaru Shakur. There are of course more than ten, so this may be a hard process. This is probably the nicest track from the album Me Against the World. It sums up the theme of the CD and is one of Pac's lesser well known tunes. This is a great track and has been used by lot's of other MC's including Ja Rule and Lowkey. A track from Tupac's first full album. In most people's top ten, an emotional story track that follows the trials and tribulations of a poor teenage mother. From the famous All Eyez on Me, the first album from Death Row Records. The album features some typical gang banging tunes but Life Goes On is again Pac talking about his own death. He beautifully and somewhat egotistically talks about his funeral. From the Makaveli album which came out just after his death in 1996. Krazy is another less well known track but is a great insight into the mind of Tupac. 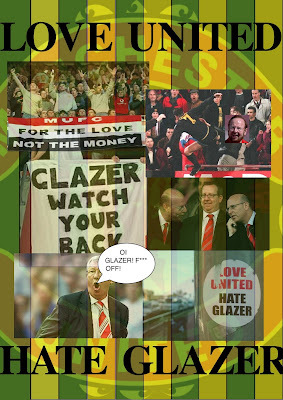 It is reflectful and displays the troubles in his minds. This tune comes from Pac's second album and is definitely worthy of being in the top 10. Pac may have been full of contradictions, with many sexist lyrics, but this is clearly a strong anti sexist anthem. He tries to convince his listeners to show more respect to women as well as sending a message to women to keep their head up with lyrics such as "when he tries to tell you, you ain't nuttin' don't believe him/ and if he can't learn to love you, you should leave him". This is Pac at his most sensitive best. A great use of Stevie Wonder's 'That Girl'. Beautiful song, again Pac talking about his personal suffering. The recurrent theme of death is again prevalent to show a truly tortured soul. The internal struggles within the MC are clearer than ever in So Many Tears. A party hasn't started until Do 4 Love Comes on. Another posthumous track but without a doubt one of his greatest. Uses Bobby Caldwell on the hook nicely. He shows his intelligence with a quote from 18th Century Scottish Poet Sir Walter Scott (What a tangled web we weave). Great video too. Perhaps an obvious choice for number one but few can deny what an amazing song Changes is. Sampling Bruce Hornsby's 'The Way it is', Pac captures the struggle against racism in America in an essentially quite pessimistic tune. He talks about the Black Panthers Leader Huey Newton who was shot for standing up for resisting racism. However the final verse is a hope for the future where all races can live peacefully. A notable lyric is "Even though it seems heaven sent, we ain't ready to see a black President". One could argue this is now dated with Barak Obama being elected US President, but the point is clear. This is an anti-racist song and for me is Tupac's best. Enjoy. All too often the media portray the BNP uncritically and sensationally, allowing them to exploit the airwaves and print to spread their inflammatory lies. 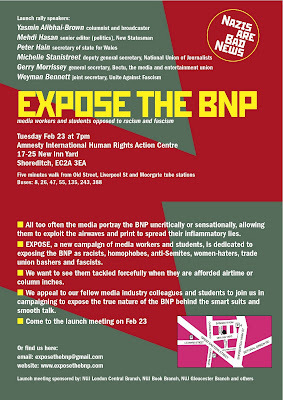 EXPOSE, a new campaign of media workers and students, is dedicated to exposing the BNP as racists, homophobes, anti-Semites, women-haters, trade union bashers and fascists. We want to see them tackled forcefully when they are afforded airtime or column inches. We appeal to our fellow media industry workers and students to join us in campaigning to expose the true nature of the BNP hidden behind the smart suits and smooth talk. Today The Sunday Times reported that a senior official at Amnesty International has accused the organization of compromising its stance on human rights by working with Moazzam Begg, a former detainee of Guantanamo Bay. Gita Sahgal, head of the gender unit at Amnesty, described Begg as a supporter of the Taliban and labeled his group Caged Prisoners ‘Jihadi’. I have heard some nonsense in recent years but this quite possibly tops it all. I have had the absolute pleasure of working with Moazzam Begg on numerous occasions, through the Stop the War Coalition, twice inviting him to speak at The University of Essex whilst I was the SU President. I have had long discussions with Moazzam and there were issues we had disagreements on. But to label the man as a supporter of the Taliban is inaccurate and offensive. I can think of many events where Moazzam has publicly condemned terrorism and expressed sadness for the victims of 9/11 as well as the London bombings in July 2005. However, he is quite right to argue that these events do not excuse the clear violation of human rights shown by the western governments in the so-called ‘war on terror’. A war that has had millions of victims, from the dead in Iraq and Afghanistan to those illegally detained elsewhere. One of which has been Moazzam Begg himself, detained first in Bagram and then the infamous Guantanamo Bay for a total of three years. Begg has never been convicted or charged with any crime, but will forever be scarred by his three years of detention, in which he saw two fellow detainees beaten to death as well as children as young as twelve in detention. Moazzam Begg knows about human rights abuses more than most. Amnesty International is absolutely right to work with activists like Begg who have first hand experience of the violations made in the name of anti-terrorism. Since 9/11 we have seen a massive campaign of hate against the Muslim community worldwide, encouraged by global leaders. It’s no wonder that the BNP can stand by the side and rub their hands together as governments fall over each other to show how tough they are on terrorism. It is this atmosphere that has led to the huge wave of Islamophobia that has swept across Europe. From the Swiss ban on minarets, to the niqab ban in France and of course not forgetting the racist anti-terror laws in Britain. University campuses are constantly spied on for signs of ‘radicalisation’, and Islamic societies have been targeted for growing terrorists. The reality is that the radicalization of young Muslims doesn’t take place in the mosques, the schools or the prayer rooms. It comes from switching on the television and seeing the daily images of the wars waged by the British and American governments that have ripped through the Middle East. It comes from the silence and the compliance of the same governments when Israel launches yet another onslaught on the suffering people of Palestine. It comes from the Islamophobia that has become a recurrent part of the lives of British Muslims over the past few years. So Amnesty is absolutely right to campaign on behalf of those who have been targeted time and time again. To ignore the plight of the Guantanamo detainees is to fail in advocating human rights. Gita Sahgal claims that this campaigning damages the integrity of Amnesty and is a threat to human rights itself. So should we sit back and ignore the crimes of western governments? Should we pretend that America and Britain are the champions of human rights and the backwards Middle Eastern countries need to follow our lead? Bush and Blair wanted us to think that in 2003, and look where it got them. Anyone who seriously tries to say that Afghanistan and Iraq are better places to live now than before should go there and ask the people themselves. It’s very easy to sit in the comfort of expensive London home and talk about others. So I congratulate Amnesty for their tireless campaigning for the closure of Guantanamo Bay and for their defence of the victims of the war on terror. And Moazzam Begg should not be hounded and accused of extremism by those who should really know better. A couple of newspaper articles are nothing compared to three years in illegal detention, but Moazzam does not deserve that treatment. For somebody who has been through what he has and is still standing today, fighting injustice and campaigning for what is right, the man should win a medal. Sadly, the only thing that hangs around his neck is the memory of Guantanamo and the relentless racism that just won’t go away. In July the Iranian people took to the streets to demonstrate against tyranny and were met with brutal repression. Six months on, the very same people have refused to give up their fight and continue to defy an increasingly violent state response. The stakes are high but so is the resolve and fight of the Iranian masses. At the same time in the plush fortresses of global leaders, plans are circulating to capitalize on the unrest. The people of Iran are not only facing the struggle of their own leaders but also the threat of crippling foreign sanctions and military engagement. The disputed Presidential election of last July was the catalyst that led to the instant emergence of a dynamic and mass opposition movement that was prepared to take on the might of the Iranian establishment. Whilst they need no excuse to continue the protests, they have used every opportunity to do so. The latest round of protests began on 7th December on Student’s Day. A date used to remember three students killed during the protests against the notorious and bloody coup of 1953, in which the democratically elected Dr Mossadeq was replaced by the dictatorship of the Shah. In cities across the country, students turned commemorative rallies into mass demonstrations, clashing with security forces and the state pro-government Basij militia. Reports from Iran claim that almost every single day the universities are alight with student protest. On December 19th the news broke of the death of a leading opponent to the government, Grand Ayatollah Hussein Ali Montazeri. Montazeri had been a leader of the Iranian revolution of 1979 and at one point was widely believed to be the named successor to Ayatollah Khomeini, the first supreme leader of the Islamic Republic. However, in the post revolutionary years Montazeri became increasingly critical of the lack of human rights inside Iran, as well as the subjugation of women. A week after the death of Montazeri the religious festival of Ashura took place. Ashura is a massively significant time for Shi’ites as it remembers the killing of Imam Hussein in what is seen as a cruel and oppressive act. His death is seen as an example of a small minority standing up to tyranny and oppression in the face of huge adversity. It was this spirit that encapsulated the mood of the protestors as they took to the streets once again to challenge their modern day oppressor. Before the festival the government and conservative clerics had made menacing warnings to ‘crush’ those who wish to ‘exploit’ a religious festival. Yet the warnings were not heeded and in all the major cities across Iran hundreds of thousands came out to rally against oppression. Sadly, the ominous threat from the state was not an empty one and security forces and the Basij were let off their chains to attack the protests. Hundreds were arrested and nine people were killed, including the nephew of Opposition leader Mir Hossein Mousavi. The state then continued with its crack down, arresting more activists, journalists and others. What this recent explosion of revolt shows is that this movement is certainly strong enough to continue to mobilize and brave enough to face the repression. But perhaps more importantly the continued resolve shows that the demands now go beyond the disputed election. In the original wave of protests much of the slogans concentrated on the vote rigging and it was hard to decipher what the wider demands were. However, now the movement has begun to create a number of unified demands that extend beyond the election and are searching for democracy and even a separation of religion from state. There are of course still various strands to the movement, as the reform movement has always been a wide grouping. The election provided a momentary rallying call for all reformists in Iran but it seems now they are trying to go further to create an alternative vision. At the beginning of January a manifesto was released by five prominent Iranian exiles. The program claims to support the pluralistic nature of the Green Movement. The basis of the manifesto of course calls for the immediate resignation of Mahmoud Ahmadinejad as President as well as the abolition of the clerical voting system and vetoing of candidates. However it also calls for the recognition of law-abiding political, student, non-governmental and women’s groups; labor unions; freedom for all means of mass communication; and an independent judiciary, including popular election of the judicial chief. The creators of this manifesto admit that there are still many more demands but this was a modest attempt to theorise the movement. What is true is that if any of these demands were to be met, it would certainly be a radical step for a country so blighted by a lack of freedoms. From the outset the movement has caused huge ruptures at the top of Iranian society. Given that many of the movements leading figures, such as Mousavi himself, have come from the ruling class, it is no major surprise that they have been affected. However cracks in the regime are not a new phenomenon. Before the protests sprang into life, debates had already been on going about the nature of Ahmadinejad. Many in the political establishment feared his ‘provocative’ attitude towards the West ad saw him as reckless, particularly in the face of threats from The Bush regime as well as Israel. But for Ahmadinejad, standing up to the west has been a political tool rather than a dogmatic principle. When he was first elected in 2005 the Presidential hopeful had promised to end corruption and distribute wealth, as well as standing up to ‘the Great Satan’. However with corruption on the increase and inequality wider than ever, he has relied more and more on goading the west to consolidate support at home. However, once the movement exploded these splits became magnified in the face of a threatening opposition. Some sections looked to try to calm the masses through appeasement, although the official line from the supreme leader Khameni was clear; to crush the protests. Hence the brutal, albeit erratic, nature of the repression. There has appeared to be mounting tensions between the Iranian Revolutionary Guards and the state itself. The revolutionary guards seem to be trying to take an increasing amount of control in the state and are using their necessity to the regime during the protests, to do so. The Guards were originally set up with the aim of ‘defending the revolution’ but in recent years have become a force of their own, taking control of certain industries during the period of rapid privatization in the 1990’s. In the run up to the 2009 election, the conservatives in government had been far from united. A group of influential conservatives had pulled away from Ahmadinejad and created their own list of candidates. They were careful to not publicly display their differences in opinion but in reality a power struggle had emerged. These contradictions and differences are continued through the top of a very unstable society. This is why the Green movement was able to knock the regime back in such an effective manner. Meanwhile, western leaders watch closely. It is no secret that The United States has been in confrontation for some time with Iran. For all the talk of engagement from Obama, in reality, there has been little change from the regime of George W. Bush. The former President may have preferred a more direct confrontation than Obama, but the conclusions are the same; to isolate and to pressure Iran into submission. The main thrust of the accusations against Iran has been focused around Iran’s nuclear programme. It’s an issue that seems to keep appearing when it suits the United States to do so, and since the July protests began it has been a common theme. Iran is already under three sets of sanctions that have been placed by the United Nations. The latest deadline fell on 31st December and a meeting of six major powers took place immediately to discuss the next step. Senior officials from Britain, America, France, Russia and Germany met, with China sending a lower level diplomat, signaling their reluctance to back tougher sanctions. The official line from the meeting is that no decisions have been reached although tougher sanctions are certainly in the pipeline if Iran continues to ignore calls to halt enrichment expressing concern at Iran’s "insufficient cooperation" with the UN International Atomic Energy Agency. For the west the fear is that a nuclear Iran will seriously alter the power map of the Middle East, with a bitter enemy as a serious power. In addition Obama will not want to be seen to fail on one of his major policy objectives of dealing with the Iran issue. From the Iranian point of view a confrontation with the west is the ideal way to unite the divided population over a fairly popular policy. Russia has increasingly become annoyed with Iran’s refusal to begin negotiations and the only obstacle to further sanctions seems to be China. It is well known that China, who have a veto on the UN Security Council, have a strong trading agreement with Iran in which China benefits from selling petroleum. China does not want sanctions to affect this business arrangement. However, China itself will be wary of isolating itself within the Security Council, especially now as Russia appears to joining the sanctions bandwagon. What is clear is that at some point sanctions will begin to hurt the Iranian people. Both in damaging the movement, by providing an excuse for the regime to crackdown, and by causing problems afflicted upon Iraq when Saddam’s regime was under UN sanctions. Between 1990 and 2003 sanctions had created a humanitarian disaster in Iraq with up to a million children dying as a result. Economic sanctions cause people to suffer, not leaders. This leaves the Iranian people in a perilous situation. On the one hand they are courageously fighting their own regime and on the other they face the prospect of western sanctions. A real concern is that a false dichotomy will be created that already exists in other Middle-Eastern states, where to support the regime is to be anti-western and to oppose the regime is to support the west. This is not what the Iranian people want. Thirty-one years ago they disposed of a dictator who was a puppet of the west. They rejected western influence but they also wanted democracy, civil rights and power. They achieved the independence but not the control they would like in their own country. Whatever the next move from the west and the Iranian regime may be, it is clear that the people of Iran will continue to fight and not back down. Next month the annual ‘revolution day’ takes place, marking the 1979 revolution. More protests have been promised and whilst there may be many differences between 2010 and 1979 the resolve of the Iranian people is the same. Whether the regime opts for appeasement or repression, this movement will simply just not go away. A huge crackdown against journalists has been taking place over the past few weeks in Iran. even reporting anti-government protests has become a crime. People are disappearing all the time. Many families do not even know where their loved ones have been taken, all the know is they have gone. Please sign the petition for their immediate release and to say no the crushing of freedom of press in Iran. The exciting, powerful and determined resistance movement, which emerged during last summer’s election fall-out, has created one of the most serious political crises in Iran since the revolution of 1979. And it refuses to go away. Meanwhile, Western leaders talk of increasing sanctions, repeating hypocritical accusations of Iran’s nuclear programme. Campaign Iran invites you to discuss the challenges ahead for the movement, and how best we can lend support to its potential success, without the interference from foreign powers.